At the height of summer when the baking heat of my home state of New Mexico becomes too much, I head for the high country of Colorado where the soothing afternoon rains, abundant fishing and spectacular scenery make for a great day. 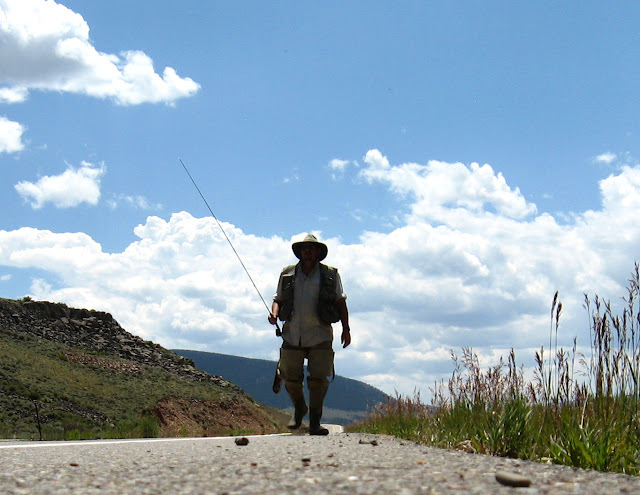 Pot # 1 above Taylor Reservoir near Gunnison, Co, where trout will take just about any kind of nymph suspended below a bubble and tossed far out into the water with a spin casting rig. 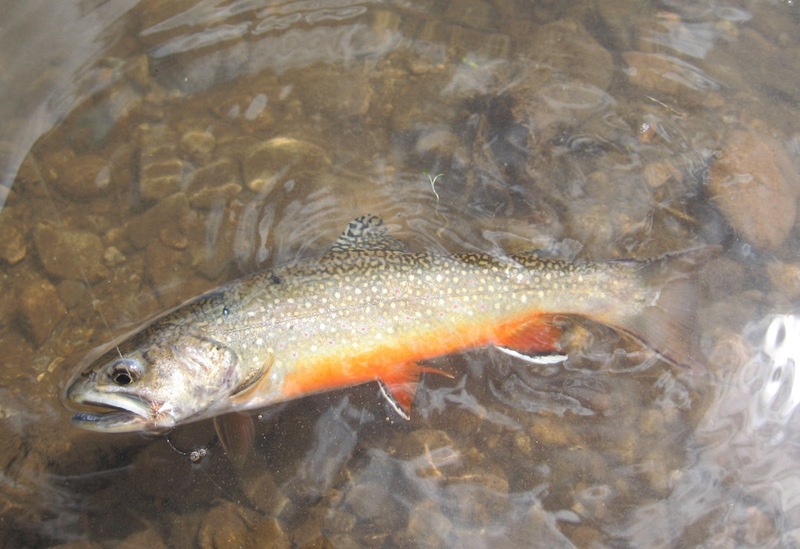 Colorado's beautiful brook trout make for an exciting catch due to their unique and colorful appearance. 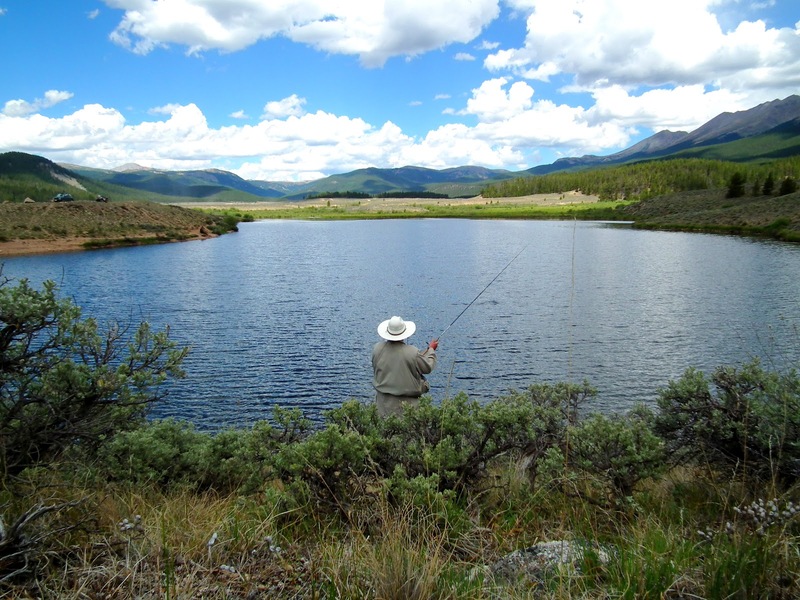 Stocked rainbow and naturally reproducing brown trout can also be found in these ponds. 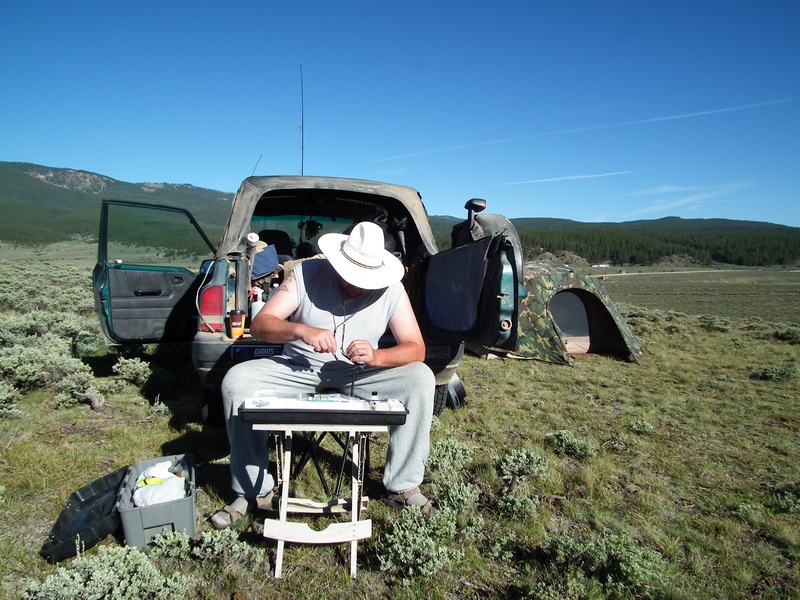 Tying flies at a makeshift camp above Taylor Reservoir where off-road, dispersed camping is allowed and provides relief from having to stay in crowded, costly campgrounds where a good night's sleep is no longer guaranteed. 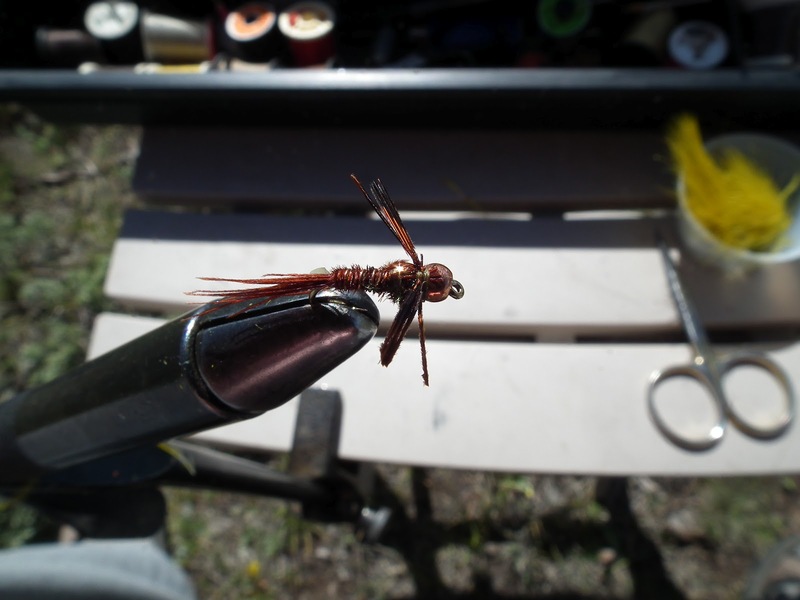 My version of a Pheasant Tail nymph tied on a #14 hook with a copper bead head and very pronounced wings has proven its worth when trolled below a bubble in many Colorado lakes, ponds and reservoirs. 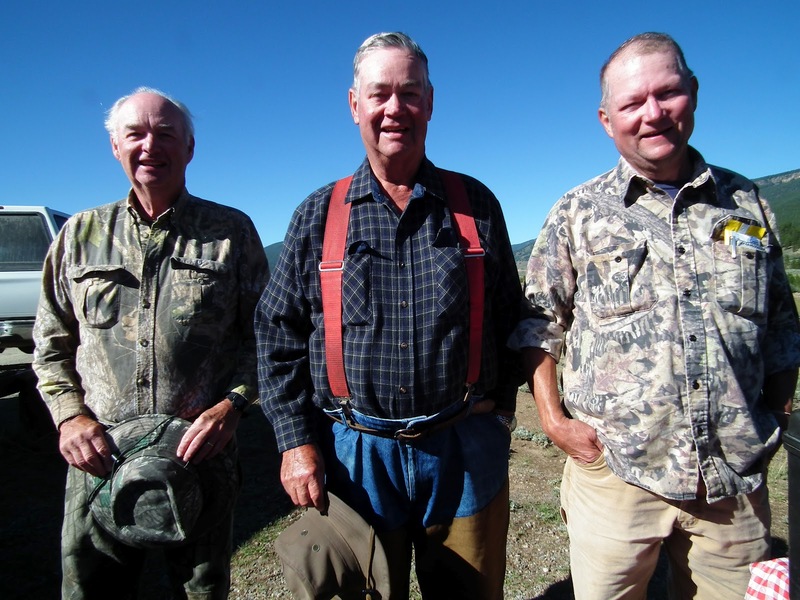 The Davis brothers of Missouri - Ray, Bud and Ed - are old school hunters and fishermen who know how to camp, cook and have a good time without smoking, drinking or cursing. They make an annual pilgrimage to Taylor Reservoir each summer and I have been blessed with an invitation to join them for many years now. Thanks guys for all you do and God bless! 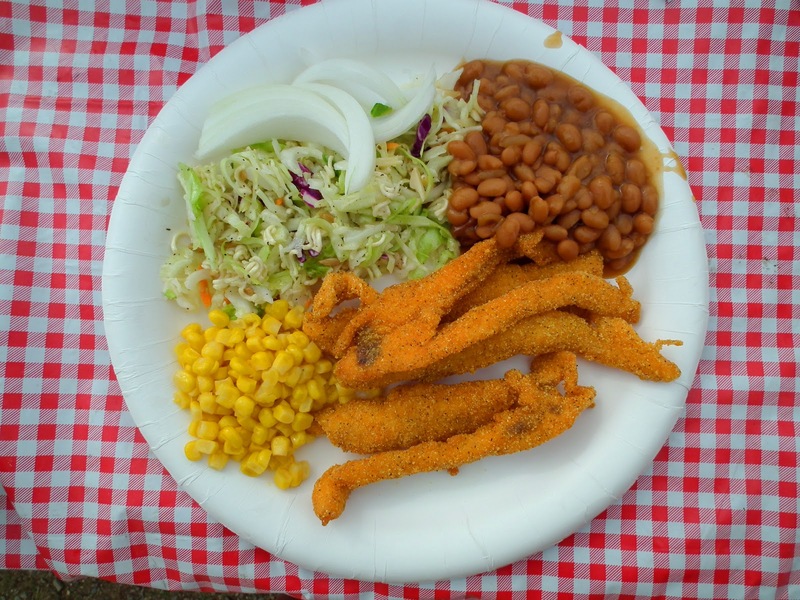 If you're lucky enough to wander by the Davis camp at the River's End Campground at Taylor Reservoir during the summer you'll probably end up with a plate of really good food in your hand. 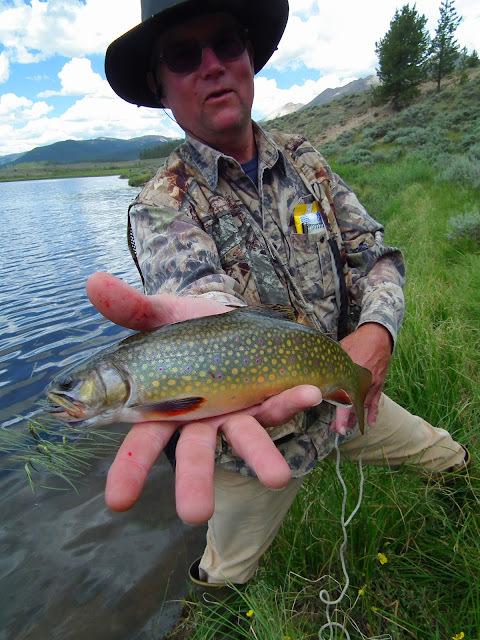 Ed Davis shows off a nice Brook trout he caught in Pot. # 1 that ended up on the stringer and destined for a fish fry. 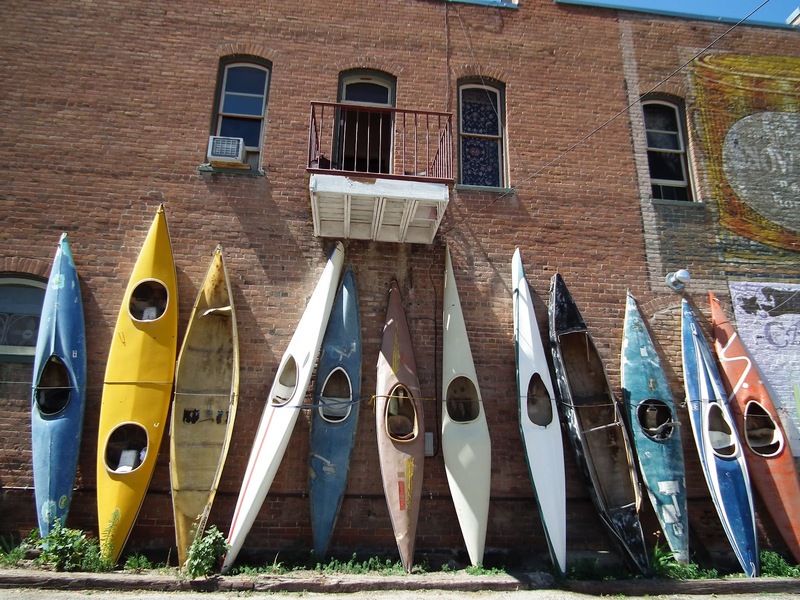 Dozens of others were caught and released. 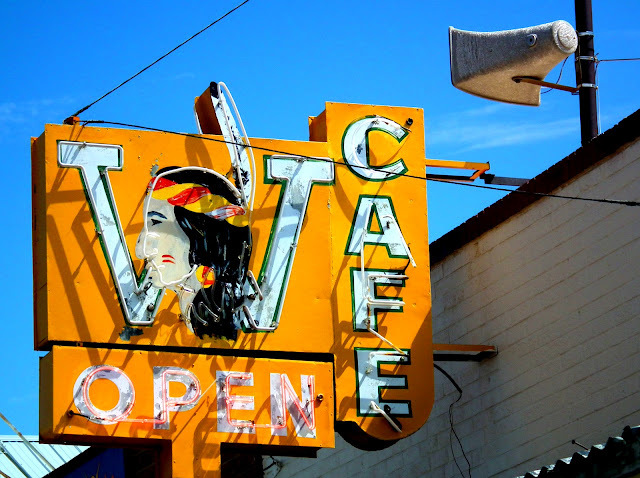 Breakfast at the W Cafe in Gunnison turned out to be a real treat with well prepared and good sized servings but it was the side of vegetarian, green chile sauce that truly impressed me. 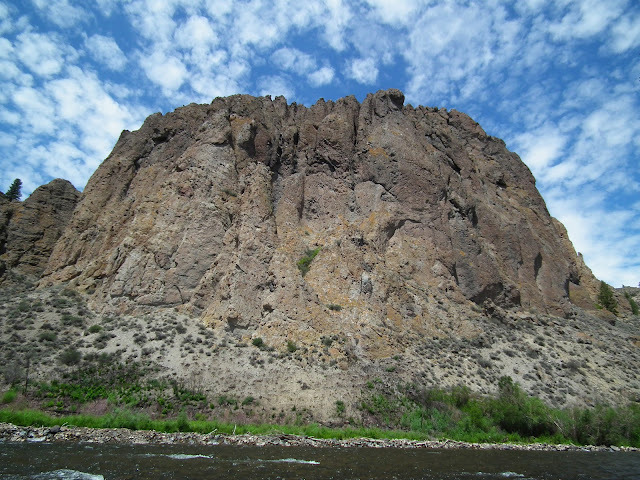 It seems everything in Colorado is BIG including this rocky mountain overlooking the Gunnison river in an area called Palisades Park just outside of town where public access is available. I caught a nice, fat brown trout here that fought like one twice its size. 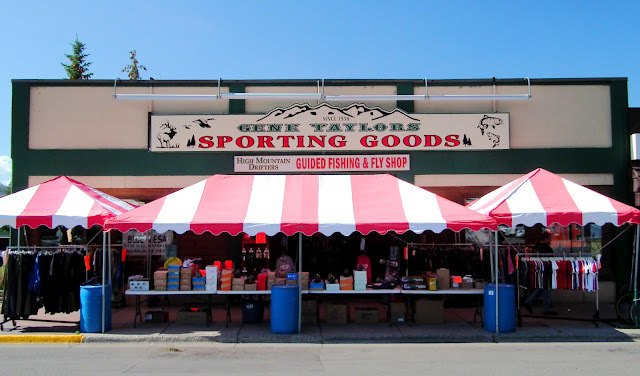 Gene Taylors is the kind of old school sporting goods store that makes you fantasize about being locked inside overnight and spending the whole time exploring the place. It has everything you could possibly need including fishing and camping gear, guns and ammo, outdoor clothing, hiking boots, you name it and they've got it. 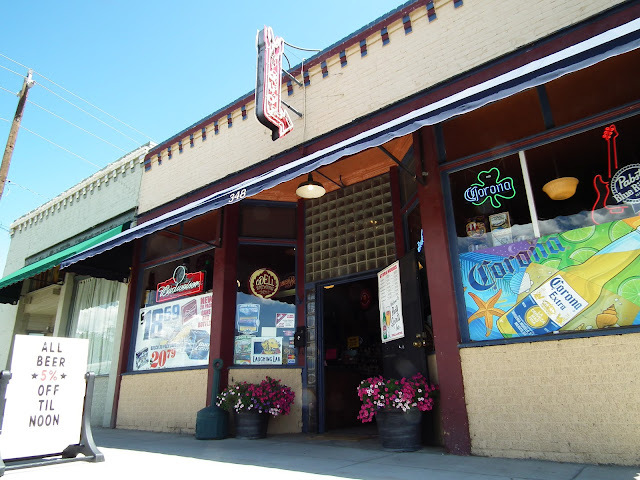 This is a required stop in Gunnison, Colorado. 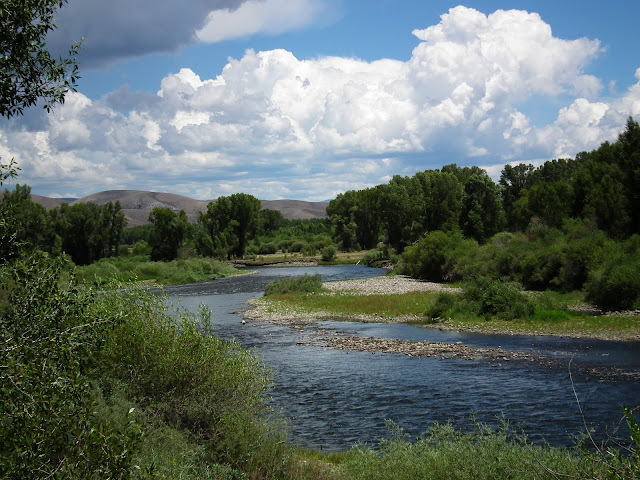 The Gunnison River south of town falls under the jurisdiction of the National Park Service which provides excellent access to many miles of river above Blue Mesa Reservoir including this spot at Cooper Ranch. 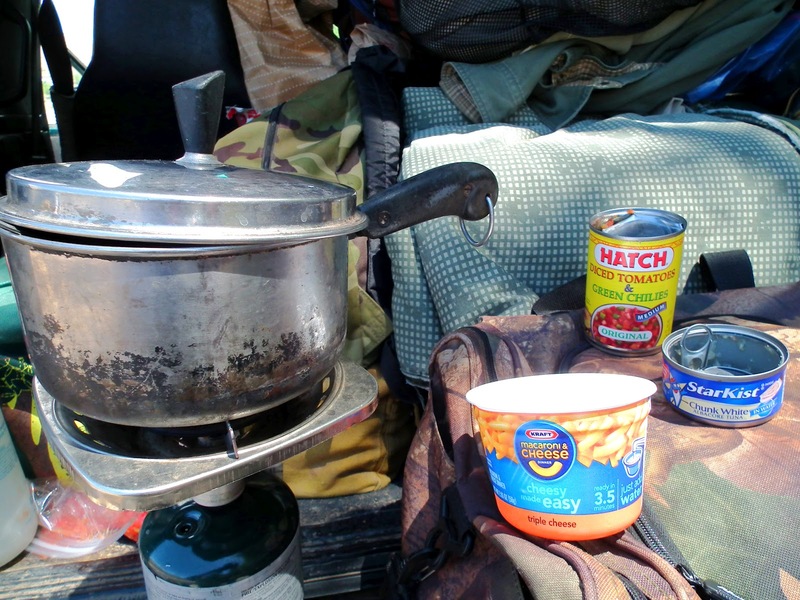 A quick and filling riverside meal, microwavable mac and cheese - simply add boiling water - then jazz it up with a little can of tuna fish, some diced tomatoes and green chiles, heat a little more and Wow! 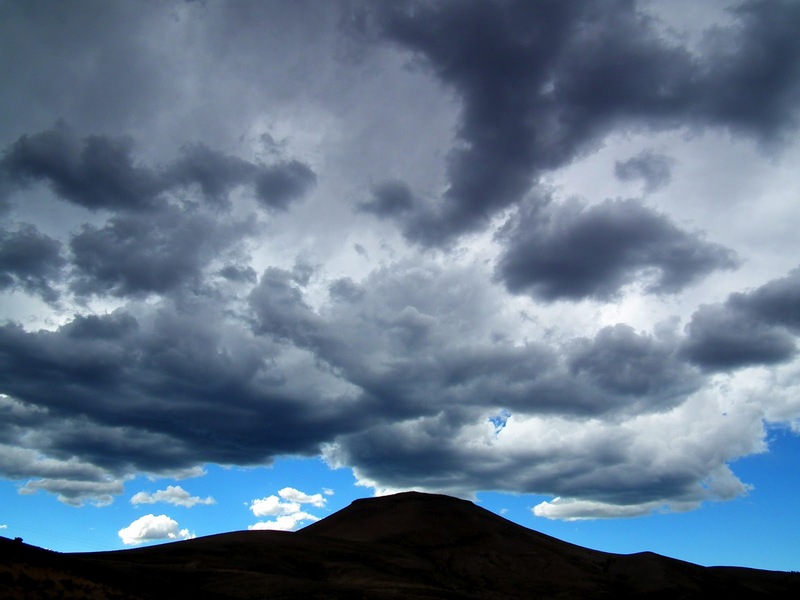 Afternoon thunderstorms were always a threat with lightening and heavy rain possible each day. By early evening things had dried out and it was time to head back down to the river. 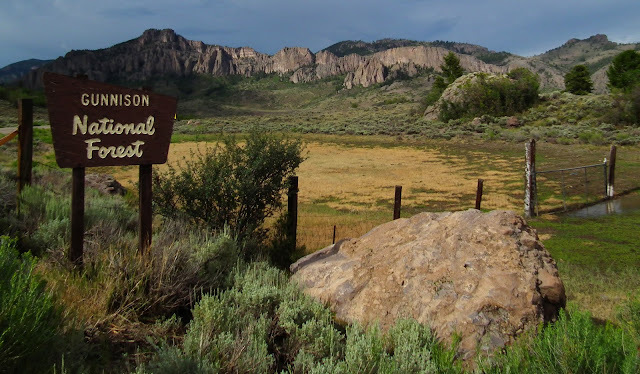 The National Park Service's Ponderosa Campground on the Soap Creek Arm can be found after crossing Blue Mesa Dam and following a good gravel road up towards the bordering Gunnison National Forest where postcard scenes appeared everywhere. 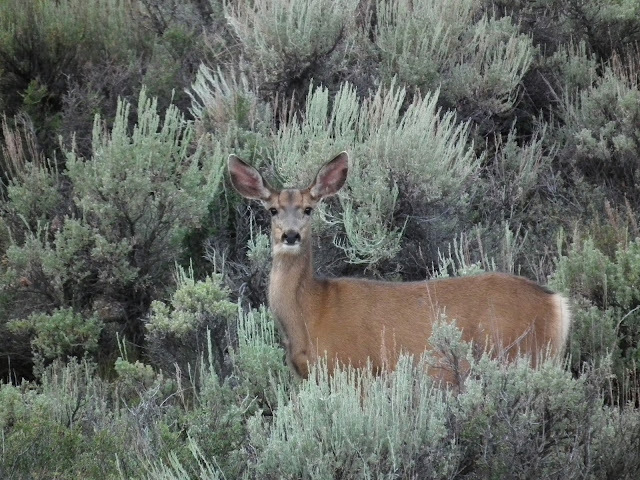 Mule deer ventured into camp at Ponderosa during the evening hours and provided the kind of entertainment that's difficult to find on television. 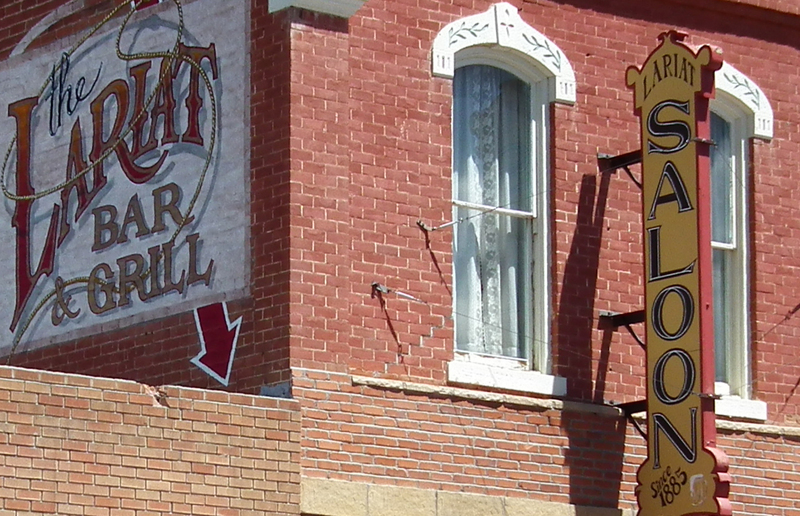 When leaving Taylor Reservoir one can opt to climb Cottonwood Pass and head over to Buena Vista on the Arkansas River where Victorian architecture abounds, the folks are real friendly and the river rules! The Bunea Vistas White Water Park on the Arkasas River. A sweet spot to take a dip after a week of sleeping in the dirt. Old kayaks line the wall of an old sporting goods store in historic Salida on the Arkansas River in southern Colorado. Liquor stores in Colorado sell full strength beer while convenience stores and supermarkets only carry the more subdued version of 3.2 beer. It's all good when you're thirsty. 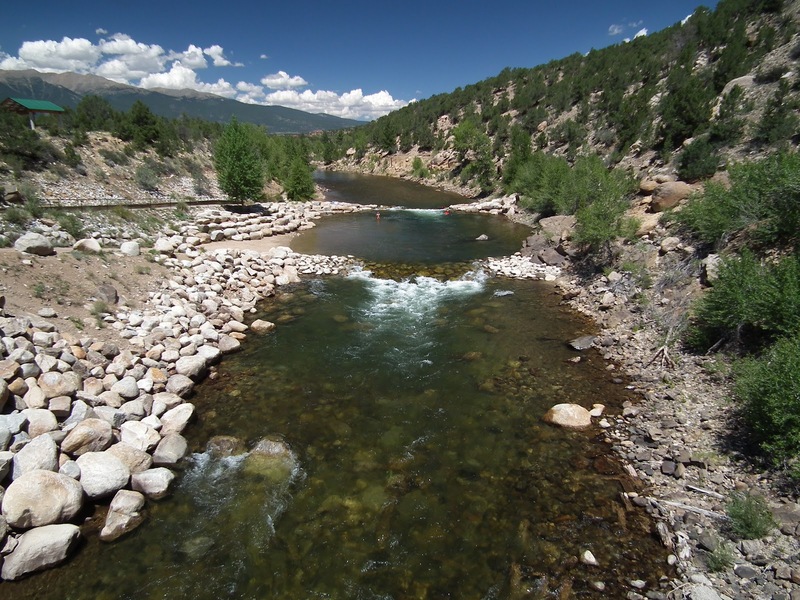 There's a reason Colorado is the fittest state in the nation and that's because no matter what you're doing it's gonna take a long hike to get there.